If you are interested in volunteering to translate 25 Lessons into another language, please send me a note at lorenzo@25Lessons.com. The following languages already have designated translators: Italian, German, Brazilian Portuguese, Spanish and Catalan. Details follow. In return for your work, you will get credit as the translator of the book itself and on all websites and promotional materials promoting the book. When we go to print, you will also receive a printed copy. And for the life of the published book, if you are the sole translator, you will receive 5% of net revenue, after production, marketing and promotion expenses. The book has already been translated or soon will be translated into other languages as well. Angelo Amboldi, an Italian surgeon, author and photographer living in Milano, translated the book into Italian. Christian Schierig, another friend and fellow photographer who lives in Düsseldorf, has agreed to translate it into German. Artist, musician and photographer, Ivna Mei is translating into Brazilian Portuguese. Carme Prado in Barcelona, Spain is working on a translation into Catalan. And, I am working on a translation into Spanish. I really firmly believe that whomever participates in this endeavor will find this to be a rewarding and fun project. With the Spanish translation, I am finding that it is great practice and that I am relearning a lot about language and the important subtleties of writing. 1. Write a translation that creates poetry out of prose. 2. Write a translation that has universal appeal to speakers of the translated language everywhere. Seeking a creative balance between words and phrases that appeal to readers regardless of what part of of the world they are from. 3. Choose the right idioms and phrases that resonate with the speaker of the language, while remaining true to the original story and my experience as a New Yorker and an American. 4. Use the informal tense/conjugation, throughout. After much debate and discussion with others, I’ve decided to make this memoir as “personal” as possible, so that it is if I am telling the story directly to the reader. I am using a number of online resources to assist my translation. I find the various choices and explanations given helps tremendously and will allow me to retain all the important subtleties conveyed via all the American cultural references and idioms unique to the English language that I use in the original book. I'm listing them below because I thought you too might find them helpful. For those willing to help, I can first translate the manuscript into their respective language using Google Translate, which I have used for other languages. I am impressed by how much Google's translator can accomplish, so I am hoping that it will be a great foundation from which to start from. The site recently added a new feature with which you can choose alternative translations for words and it will change it after you choose the word you prefer. It is very cool and I hope you find it helpful. In return for your work, I will give the volunteer credit as the translator of the book itself and on all websites and promotional materials promoting the book. When we go to print, I will send her/him a printed copy. And for the life of the published book, if they are the sole translator, I will give them 5% of net revenue, after production, marketing and promotion expenses. Although the English version of the book is selling well, it does not make much money because I sell it so anyone can afford it. If I could I would give it away for FREE on Amazon, but they do not allow this. Thus, my goal is not to make a profit; but rather for others to profit from my book and the lessons contained therein. For those who are interested I can send the Microsoft Word file of the English manuscript for your review. Thank you very much, for your time and consideration. 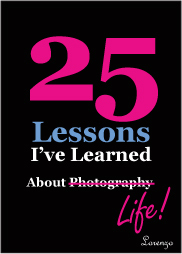 The new black & white paperback version of 25 Lessons I've Learned about Photography...Life! has just been released on Amazon. Copyright © 2005-2011. Lorenzo Domínguez. All Rights Reserved. These pages are protected by international copyright laws.